Recently, Monster Hunter World has been showering its player base with a number of updates and pieces of new content. These updates continue today with the release of the new Devil May Cry collaboration quests. This new collaboration earns players new Devil May Cry gear that make their hunter look like Dante. Below I will show you how to get the Devil May Cry armor and weapon in Monster Hunter World. To unlock the new Devil May Cry collaboration items, you need to complete a new event called Code: Red. This event can be located at a Quest Board under the Events tab. This Event is an 8* challenge with 14 Hunter Rank or higher being required level to undertake. In the Code: Red quest you will need to kill a total of four monsters in the Arena. 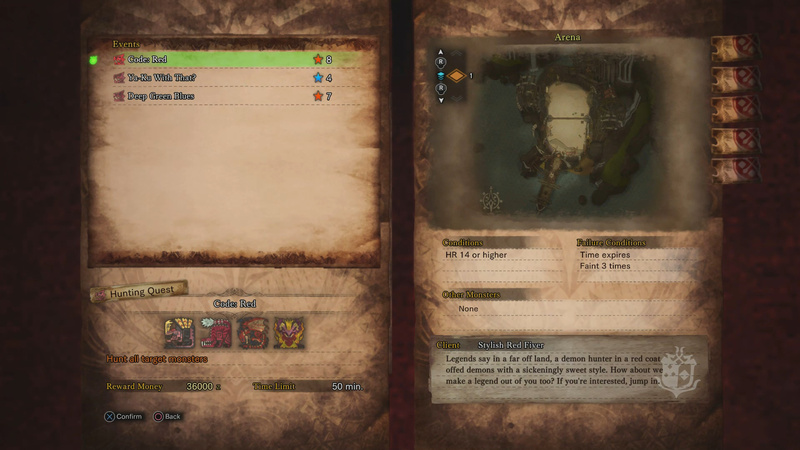 The four monsters you are required to defeat are Anjanath ,Odogaron, Rathalos, and Teostra within a total of 50 minutes. This can be a pretty daunting task solo, so be sure to grab a few buddies for help. Note: I’ve linked each monster’s guide above. Consult these to learn about their weaknesses and so on. Hair: 1x Red Orb, 5x Rathalos Scale+, 5x Odogaron Scale+, 5x Anjanath Scale+. Coat: 1x Red Orb, 6x Odogaron Sinew+, 4x Odogaron Claw+, 1x Odogaron Plate. Gloves: 1x Red Orb, 6x Anjanath Pelt+, 4x Anjanath Fang+, 1x Anjanath Plate. Belt: 1x Red Orb, 6x Rathalos Carapace, 3x Rathalos Wing, 1x Rathalos Plate. Red Boots: 1x Red Orb, 6x Teostra Carapace, 3x Teostra Webbing, 1x Teostra Gem. You will need to farm the quest in order to earn Red Orbs. This will require completing the Code: Red event multiple times if you want the full Dante set. 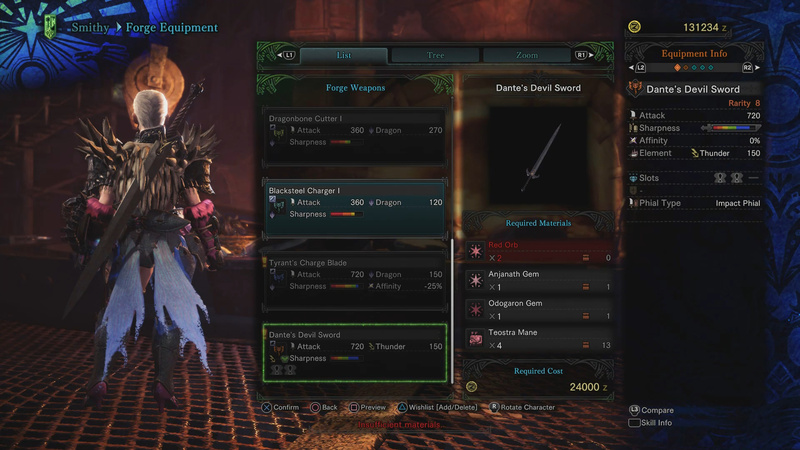 Dante’s Devil Sword is a new item you can unlock in the DMCxMHW collaboration event. 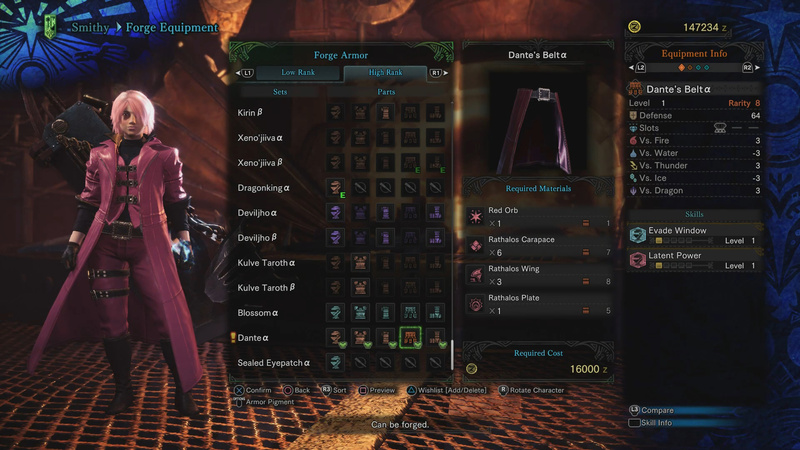 Dante’s Devil Sword: 2x Red Orb, 1x Anjanath Gem, 1x Odogaron Gem, 4x Teostra Mane. Like the armor set, you will need to farm the Code: Red event multiple times in hopes of getting the required materials to craft this sword. Thoughts on this how to get the Devil May Cry items guide for Monster Hunter World? Let me hear them in The Pit below.